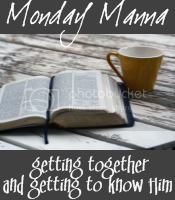 Joanne Sher: Editor/Proofreader : Monday Manna for October 19 - What is man? Monday Manna for October 19 - What is man? I'll admit that I didn't have a verse "jump out at me" to pick for this week. So, I thought I'd read a bit of Word-Filled Wednesday, hoping to find a verse that screamed "pick me." Well, I did - and it was at the blog of my dear friend Teresa Rainey. So, without further ado, here are our verses for Monday. Humbling AND wonderful, isn't it? Looking forward to your thoughts (and my own! LOL). Be sure to come back on Monday and add your entry to my post. See you then! Very humbling verse, Joanne. You're gonna make me dig deeper on this one, aren't you? Thanks. Wonderful verse, Joanne, from the very same passage I have just posted about too. Through it we can see our significance to God - we are special, we have value. I love this verse because it reminds me to notice the world around me and bask in His creation. Joanne, I have been meaning for some time to come over here and tell you how much I appreciate you. Your encouraging comments on my posts at Adding Zest have really kept me going back to try again. I can't tell you how much seeing your consistent positive response has encouraged me. Thanks, my friend!